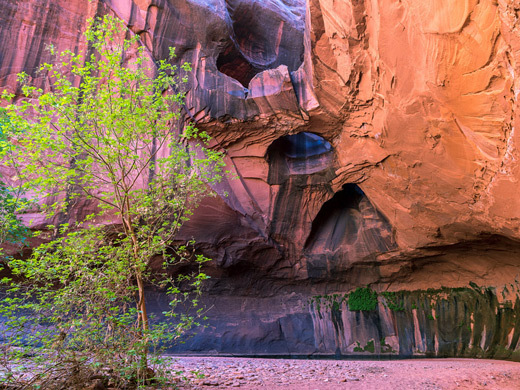 Extensive narrow slot sections, swimming pools and dryfalls are found along the 4 miles of Neon Canyon, an east side tributary of the Escalante River, but this is quite difficult to reach, testing to explore and a trip through the full length takes at least two days. So few people see the whole canyon, instead many visit the lower end, as this is the location of the 'Golden Cathedral', a beautiful natural amphitheater formed by high orange-red cliffs streaked with desert varnish, containing a triple natural bridge above a large pool. Even this is not easy to access, as to get there needs a drive of 27 miles on unpaved roads then a 2 hour hike. 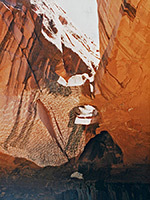 Neon Canyon is unnamed on topographic maps, in common with many of the eastern Escalante tributaries. It is the first drainage downstream of Fence Canyon (on the opposite side), and extends for 5 miles between the Baker and Choprock Benches, starting near the top of the most southerly part of the Circle Cliffs. The route to the main trailhead is the same as to the Egypt slot canyons - 17 miles down the Hole-in-the-Rock road then 10 miles to the end of the Egypt Bench side road. The last few miles of this are quite rough, for high clearance vehicles, though 4WD is not necessary and the journey can be made in a medium-sized RV. 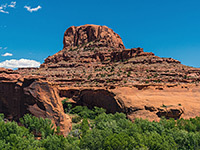 This side track ends right at the edge of the Egypt Bench plateau, which drops off steeply to the east and overlooks a vast area of slickrock, sand dunes, canyons, hills and mesas, including the Escalante River in the middle ground and the Henry Mountains in the far distance. For those intent on seeing the whole canyon, the suggested starting point is near the end of the Moody Creek Road, a branch of the Wolverine Loop Road which also passes close to Little Death Hollow. The best place to park is the Moody Creek trailhead, where the road makes a 180° turn from west to east, and then the beginning of Neon Canyon can be reached by route-finding up the Circle Cliffs a short distance to the northwest. 9 views of Neon Canyon. TopoQuest topographic map of Neon Canyon (the drainage west of 5270T). The Egypt Bench trailhead provides the main route into the middle Escalante drainage region so the path is well used and marked by cairns where necessary, as well as having a BLM trail register at the start. From the parking area the trail drops down the steep slickrock slope, crosses flatter land of rock domes and sand dunes on the way to the south (main) fork of Fence Canyon, then follows the north rim of this canyon, descending to the streambed just before the junction with the north fork. An alternative route is to drop down and descend the canyon at stream level, through some short narrows that may have deepish pools. The lower end of Fence has a permanent stream fed by springs and is quite overgrown by reeds and trees. 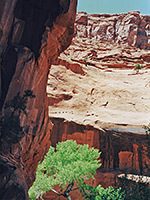 The trail winds through the shrubbery and ends beside the Escalante River, at this point about 4 meters wide and enclosed by a dense thicket of bushes. Turning south, a short walk either beside or in the river leads to a more open area where the path resumes. There are several places good for camping in this location, beneath alcoves in the sandstone cliffs that border the west side of the valley. From here, several intersecting trails follow alongside the river and reach Neon Canyon after another mile (and one river crossing) - Neon is the first significant tributary joining from the east. The lower half mile of Neon Canyon has archetypal Escalante scenery of high, vertical, streaked Navajo sandstone cliffs, a flat sandy floor and occasional bright green cottonwood trees, yet here the colors seem especially bright, deep and crisp, hence the name. The Golden Cathedral comes into view round a few bends, maybe a little smaller than it appears in some photographs but very impressive. It faces southwest, and as the canyon at this point is quite deep and narrow, it is fully lit for only a short time soon after midday. For a few hours either side, it is partly in shade and partly in sun, so less good for photography, and the best conditions may be when in complete shadow or on a partly cloudy day. The depth of the pool beneath varies but is usually just 1 or 2 meters, shallow enough to wade and walk right beneath the three openings, formerly potholes in the slot above. In summer, sunlight shines right through and illuminates more of the rocks below, which are generally rather dark and gloomy. To view this area from above, or explore further upstream, there is a route up the cliffs on the outside of the first bend in the canyon, about 15 minutes walk from the Golden Cathedral - a path up to the rim then along benches to where the drainage is temporarily quite shallow, though with no easy way to enter. Rappelling down is possible, allowing descent of the final few hundred meters of canyon, arriving at the large pool by dropping right through one of the former potholes (22 meters). There are various other possible re-entry points further up the canyon, which alternates between open areas and tight slots that contain frequent drop offs into deep pools. It can only be properly explored in the downstream direction.